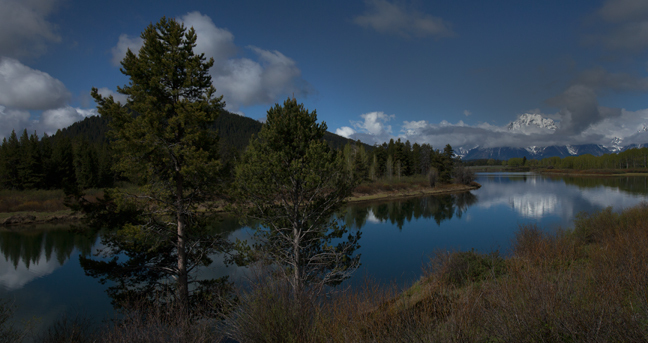 As we moved north into Yellowstone, the weather finally broke and we were able to enjoy some classic Teton scenes, such as Oxbow Bend and Mt. Moran. Both were overrun with busloads of tourists, most of whom were more interested in taking selfies than enjoying the moment. 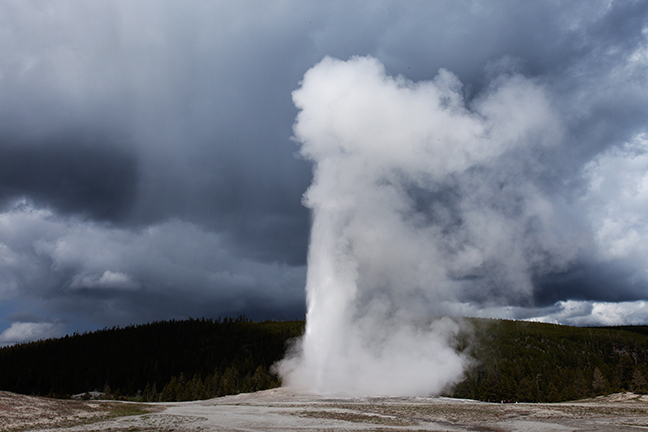 Wanting to avoid the upcoming Memorial Day weekend crowds, we immediately headed to Old Faithful and the Upper Geyser Basin, the world’s largest single concentration of hot springs. 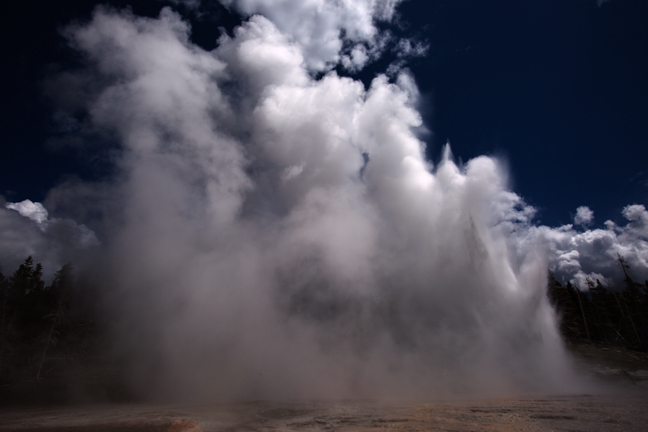 The Park now posts approximate times for six of the most popular geysers in the Park. After more than four miles later, we had watched Old Faithful erupt twice, as well as Riverside and Grand Geysers. We arrived at Riverside Geyser at the predicted eruption time where we joined busloads of teenagers and their non-attentive teachers. After about 15 minutes the eruption began. From there we took the short walk over to Grand Geyser. The fountain reached a height of close to 200 feet in a series of bursts. May 27, 2016: After a long day of geyser chasing, we settled in to The Buffalo Bar Lounge & Casino for dinner. As we soon learned, trophy mounts are an essential decor item for most every bar in Montana. It's a good place where you can get buffalo tacos, homemade buffalo chili, a buffalo brat, buffalo meatloaf or buffalo marinara and enjoy your meal under the watchful eye of a mounted bucking bison and various other large game mounts. Since we couldn't take Kodi hiking in Yellowstone, we decided to drive down to Harriman State Park in Idaho. Turns out that they don't allow dogs either, but they guided us to the Mesa Falls Trail in Targhee National Forest, where dogs are welcome and don't even have to be leashed. Kodi had a lovely romp in the woods and then enjoyed the view of Upper Mesa Falls. 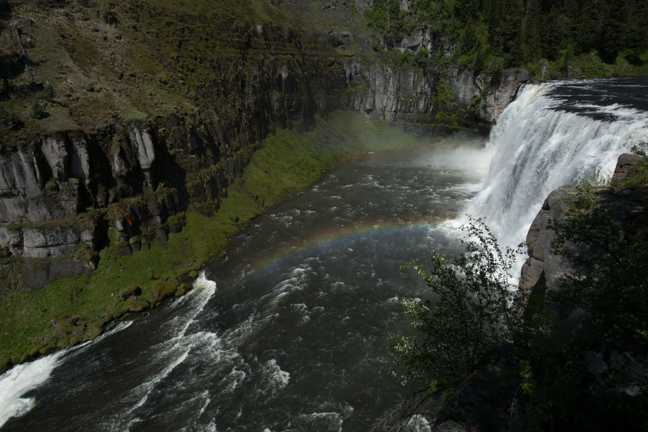 Memorial Day weekend be damned, Cynny had never seen the Grand Canyon of the Yellowstone or the iconic Lower Falls, so we headed to Canyon Village and the crowds of tourists. It was a lovely day and we had plenty of time to stop at all the turnouts along the way. 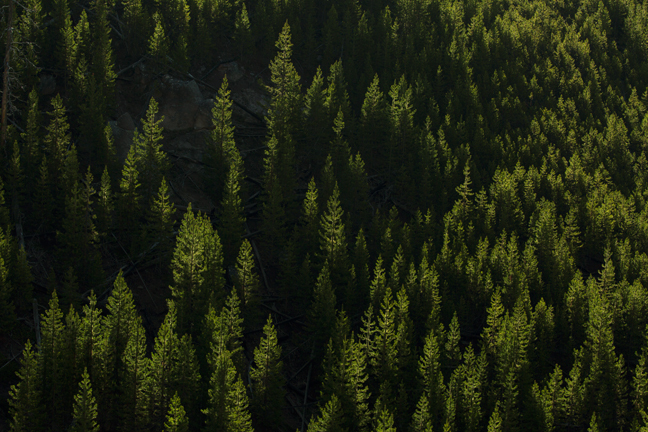 Here, at Gibbon Falls, the morning light turned the pine forest into shades of greens and shadow. 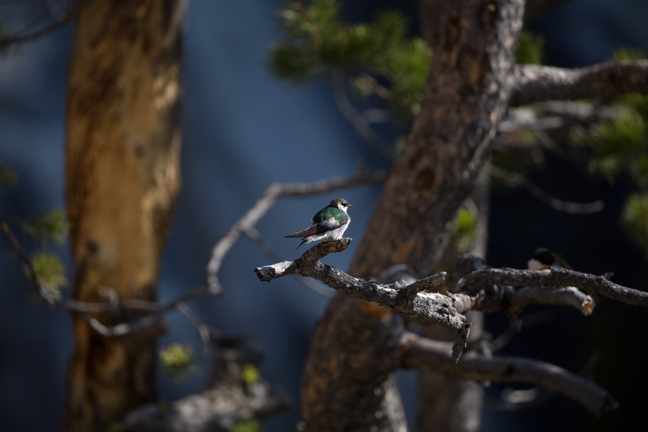 With Gibbon Falls in the background, a Violet-green Swallow rests on a branch. 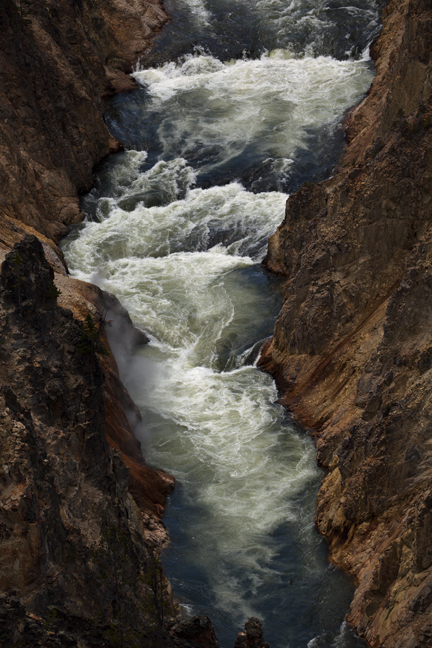 The waters of the Yellowstone River rush through the Grand Canyon of the Yellowstone. 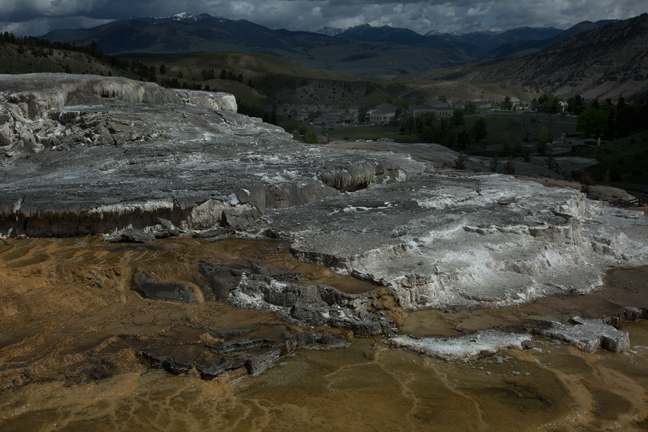 We had a picnic lunch at Mammoth Hot Springs before departing Yellowstone through the north gateway at Gardiner, MT. After lunch we checked in on the Great Horned Owl's nest that has been active for years next to one of the staff homes adjacent to the Mammoth Visitor's Center. 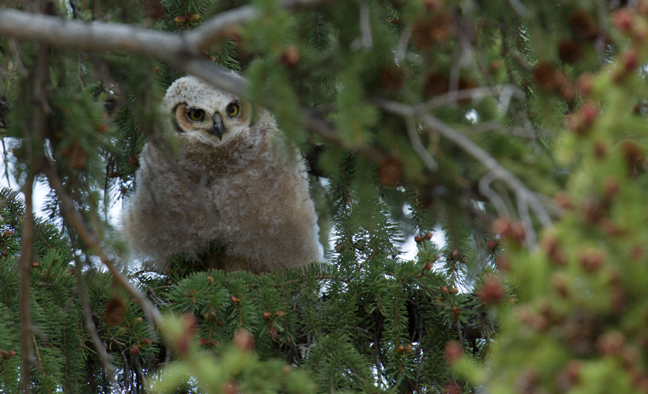 There were two chicks at the nest, but no adults present while we were there. After a lovely dinner with Ami Vitale and M. Sanjayan in Missoula, we made the short drive north to Dixon for three days at the National Bison Range. President Theodore Roosevelt established the Range in 1908. 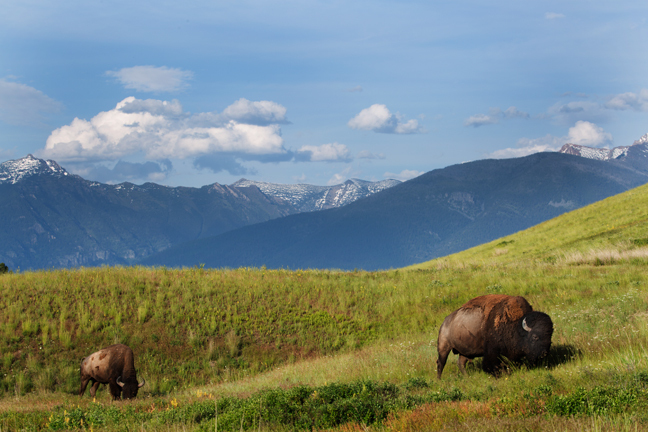 It was the first ever Congressional appropriation of tax dollars to buy land specifically to conserve wildlife. The original herd was purchased with private money raised by the American Bison Society and then donated to the Refuge in 1909 . Today, the refuge supports 350-500 bison and visitors also commonly see White-tailed and Mule Deer, Pronghorn Antelope, Rocky Mountain Elk and Big Horn Sheep. 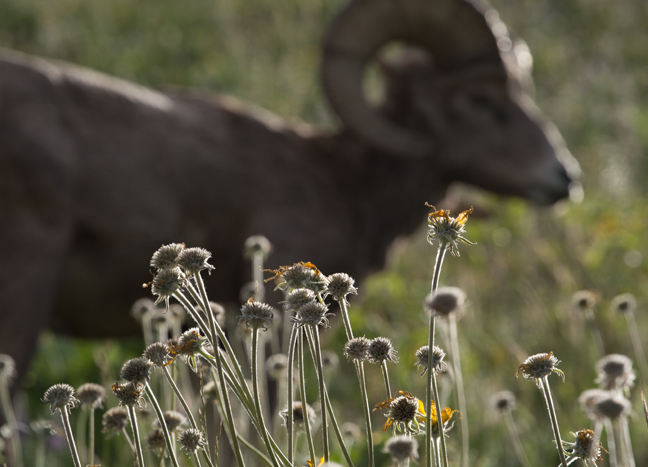 A Big Horn Sheep grazes along the steep downhill incline of Red Sleep Mountain Drive just east of High Point Trail. 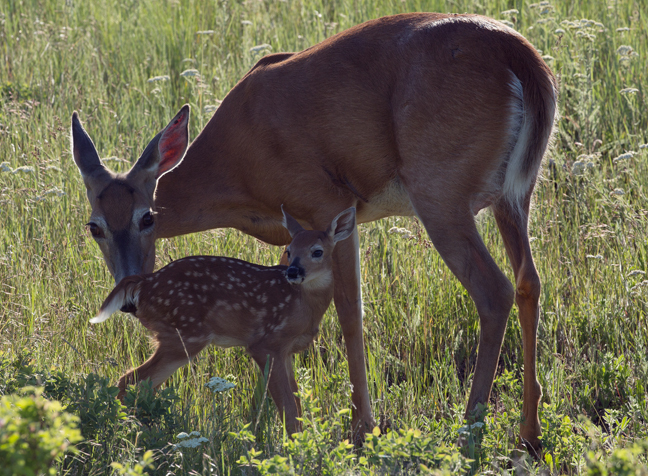 A female White-tailed Deer and her fawn along Prairie Drive adjacent to Mission Creek. After our final drive along Red Sheep Mountain Drive, we stopped in to dine and enjoy the music of Jackson Holte & Friends with the locals at the popular 44 Bar and Outwest Grill on Hwy. 93 just north of St. Ignatius. We were a couple of weeks early for their 2nd annual Brewfest when they'll be serving their popular slow smoked brisket and pulled pork outside on the patio. 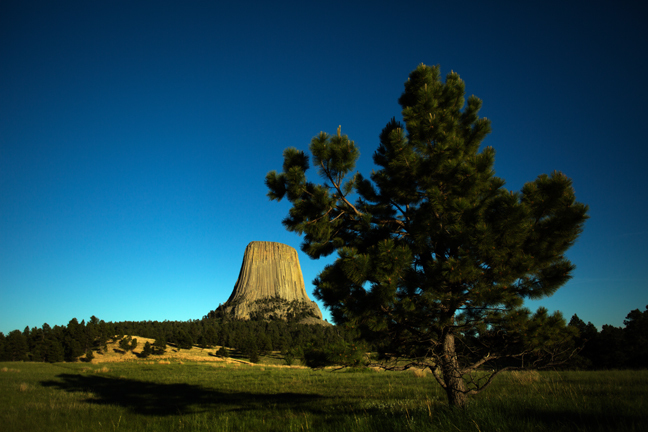 According to the National Park Service, more than 20 Native American tribes have cultural affiliations with Devils Tower National Monument. Prayer offerings (bundles and cloths), sweatlodge ceremonies, vision quests and funerals are all associated with the site. 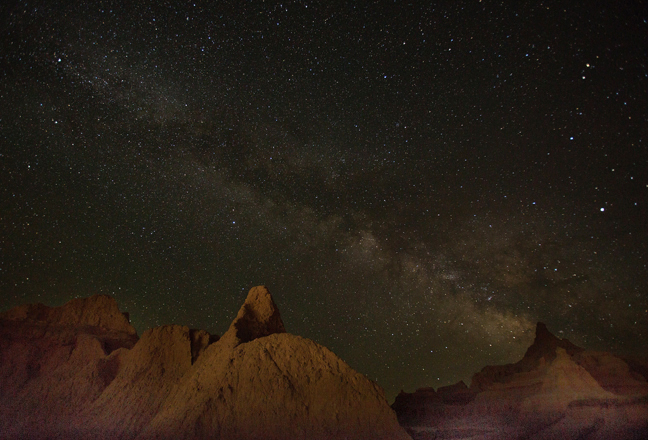 In 2014, a proposal was submitted to the United States Board on Geographic Names on behalf of the Lakota Nation to change the names of the geologic feature and the populated place "Devils Tower, Wyoming" and the President of the Oglala Sioux Tribe wrote to the Secretary of the Interior requesting the name "Devils Tower National Monument" be changed. In each instance the request was to change "Devils Tower" to "Bear Lodge." More than 20 Tribes hold it sacred and find the application of the name "Devils" to be offensive. Congress passed the first National Cemetery Act in 1867. In National Cemeteries, all rest as equals. In the Custer National Cemetery, a Brigadier General is buried directly beside a Private, conferring to each an equal honor in death regardless of their military rank in life. 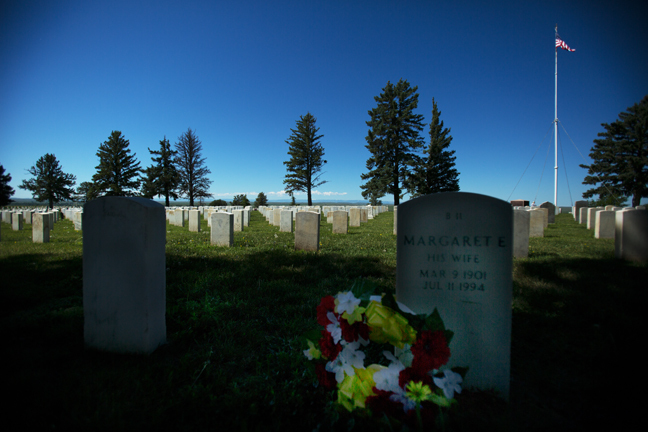 Custer National Cemetery was created after those killed in battle were already buried there. Work on Mt. Rushmore by sculptor Gutzon Borglum began in 1927 and consumed him until his death in Chicago on March 6, 1941, several days before his 74th birthday. After his death, his son Lincoln put the finishing touches on his father's vision. Borglum was also the original sculptor for the likenesses of Robert E. Lee, Stonewall Jackson and Jefferson Davis on horseback followed by a column of soldiers at Stone Mountain, GA, but he was abruptly dismissed from the project and forced to flee Georgia. 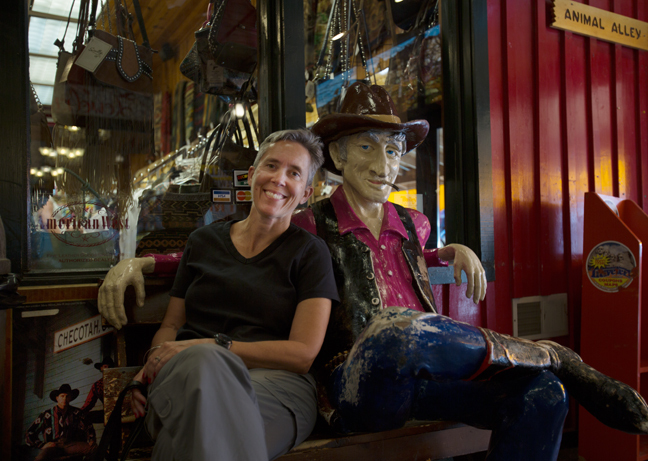 Cynny makes friends with one of the locals at Wall Drug, SD. Wall Drug is South Dakota's "South of the Border," a tacky mall that is an iconic must-see roadside attraction for travelers on I-90. 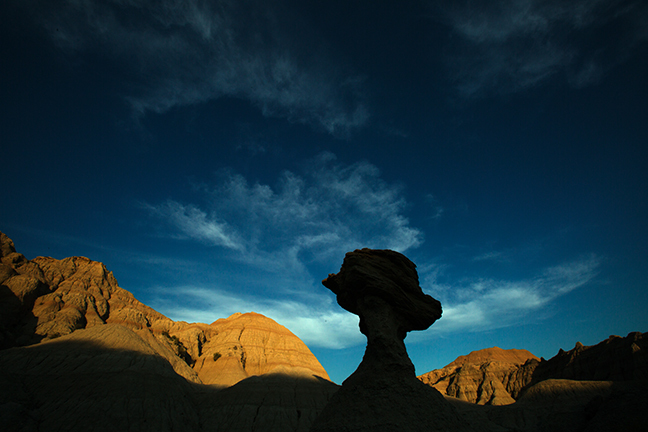 A caprock toadstool or "hoodoo" at the base of Norbeck Pass, one of the places where the road crosses The Wall, a thick ridge more than 100 miles long, leading from the upper prairie to the lower prairie. The Milky Way over The Window. 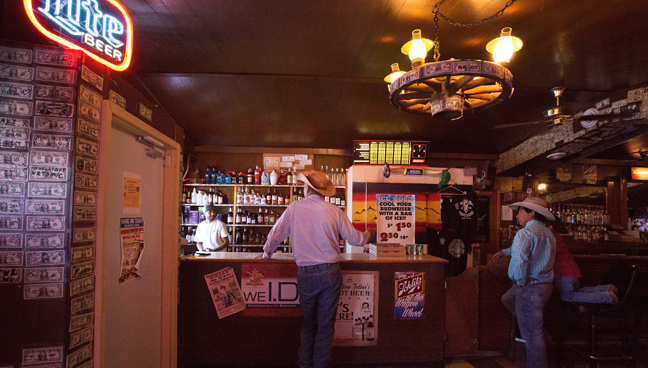 After a late night of photographing the Milky Way, we stopped at the Wagon Wheel Bar, on Main Street in the neighboring town of Interior, SD, population 67, for an early lunch. While in town, we also got gas at Cowboy Corner and shopped at the Badlands Grocery. These cowboys stopped in to pick-up some pizzas and Mountain Dew while we were having lunch. The bar is also the town's liquor store and casino. After enjoying an overnight with Stretch, Noni and Grace Ledford at their beautiful Champaign-Urbana home, Grace enjoys her Cocoa Puffs breakfast at the Beckman Café on the University of Illinois campus, as Princesses Elsa and Anna watch on. The Beckman Institute, which fosters interdisciplinary work designed to transcend the limitations inherent in traditional university organizations and structures, was funded by "Uncle" Arnold and "Aunt" Mabel (unfortunately not related). The highlight of our overnight in Franklin, TN was our dinner of pulled pork and chicken washed down with sweet tea at Puckett's Grocery and Restaurant . We regularly ate at Puckett's during visits to Nashville when Emmie was at Vanderbilt and this was our second visit to their Franklin location. The first was in September 2015, prior to attending the championship game of the Sulphur Dell Cup to determine the champion of Tennessee Vintage Baseball Association Tournament, where we watched the Travellers Club of Brentwood defeat the Nashville Maroons 23-14.